January is typically the time when holiday bills come due and resolutions to save more money are made, which is why I'll be focusing on drugstore delights in this month's Product Reviews. After all, a love of beauty doesn't have to break one's budget! Moist makeup removal cloths are my new obsession; they're just so convenient, particularly if they're formulated to remove waterproof eye makeup. 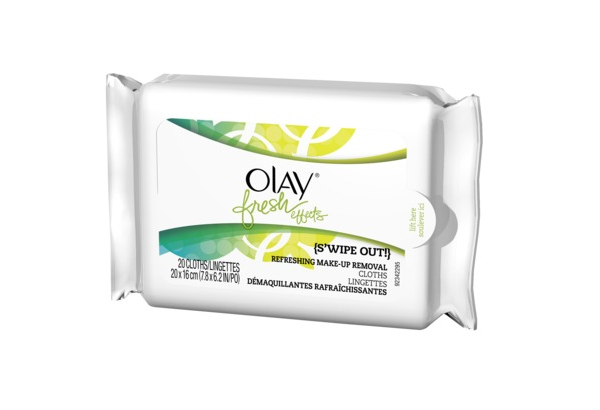 Of the brands I've tried, I'm pleased to say the Olay Fresh Effects Swipe Out Refreshing Make-up Removal Cloths ($3.99 at Target) perform just as well as pricier versions. The Olay cloths take off BB cream, concealer, lipstick, and mascara all at once, while the oil-free formula infused with Olay moisture and vitamin E leaves skin feeling soft with the lightest, most refreshing scent. I've been using them to remove my makeup before washing my face with a gentle sudsy cleanser, which cleanses effectively without overdrying. If you're prone to falling asleep without washing your face (gasp! ), or you go straight from work to the gym and sweat with a full face of makeup on, I highly suggest you grab a couple packs of these cloths and keep them wherever is most convenient: beside your bed, in your gym bag, in the bathroom medicine cabinet, at your desk. Your skin will thank you. Besides, it's a new year—isn't it time you cleaned up your act? I love these! I must repurchase them - only towelettes I've ever liked! They're surprisingly hard to find in stores. I was looking for them at London Drugs with no luck. Oh no really?! Geez! I'll see if I can track them down! I used these and didn't love them. They were good for light makeup, but nothing else. They're definitely on the gentle side, and I found they had some difficulty with really stubborn waterproof mascara formulas. But most of the time I only ever wear light makeup and non-waterproof mascara, so they were perfect for me.